Breast cancer patients may get a welcome respite from one of the disease’s dreaded aspects — its aggressive and costly treatments. New research suggests that thousands of women with early-stage breast cancer who now are told to get chemotherapy don’t need it, while a larger, significant number of patients can benefit by halving the time they’re told to take an expensive drug with harsh side-effects, especially for the heart. Although this information should be taken in a positive light, patients should consult with their doctors about appropriate treatment for their individual case. The prospective shifts in breast cancer treatment, based on new findings, may add to rumblings and criticisms about over-treatment and whether doctors have taken too lightly the toll — physically, mentally, and financially — that this and other forms of cancer inflict on patients. Patients affected by the new findings include women who, like most in the study, have early-stage breast tumors measuring one to five centimeters that have not spread to lymph nodes; are sensitive to estrogen; test negative for a protein called HER2; and have a score of 11 to 25 on a widely used test that gauges the activity of a panel of genes involved in cancer recurrence. The gene test, called Oncotype DX Breast Cancer Assay, is the focus of the study. 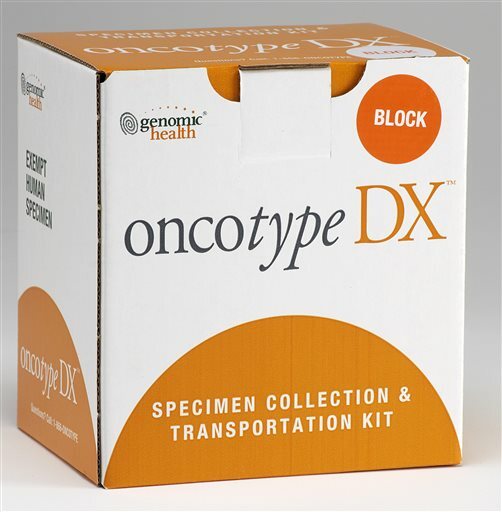 Other gene assays exist, but this one is the most widely used in the United States. It is performed on tumor samples after surgery, to help determine whether chemo would help. The test is generally done for early-stage disease, not more advanced tumors that clearly need chemo because they have spread to lymph nodes or beyond. The test, available since 2004, gives scores from 0 to 100. It costs about $3,000, and insurance usually covers it. Previous research has shown that scores 10 and under do not call for chemotherapy, and scores over 25 do. But most women who are eligible for the test have scores from 11 to 25, which are considered intermediate. Because so many women fell into a “gray area” group, doctors typically ordered chemotherapy for them. But the American and Canadian governments, joined by philanthropic groups, launched and funded a study, TAILOR-x, starting in 2006, of more than 10,000 women, with follow-up on more than 9,000 of them, to determine the necessity of chemo for mid-risk patients. Separate research, which is still in the works and has not been published in a peer-reviewed medical journal, has increased support for patients and their doctors to halve the time that early-stage breast cancer patients take the widely prescribed drug Herceptin, also called trastuzumab. Doctors have recommended that hundreds of thousands of breast cancer patients take the drug for a year or more after their diagnosis, though Herceptin has notable, sometimes harsh side-effects, including heart damage. But a study by the British government suggests that early-stage breast cancer patients fare just as well with a six- rather than a 12-month regimen of Herceptin — which also costs $76,700 annually, the New York Times reported. The drug’s maker said it is examining data on shorter dosages of its product but emphasized that, as of now, the federal Food and Drug Administration, based on data submitted to it, has approved only the longer Herceptin regimen for breast cancer care. The New York Times underscores that it is costly and rare for research to be conducted on drugs’ effectiveness, including their dosage and term of use, because follow-up studies require finding and tracking many more subjects and for longer periods. And, really, who is seeing enough stars after falling off the back of that rutabaga truck to think that profit-hungry Big Pharma would work against its own interests — though, perhaps, to patients’ benefit — by researching how to sell fewer drugs, for less time, and in elaborate and costly therapies? In my practice, I see not only the harms that patients suffer while seeking medical services, but also their struggles to access and afford safe, effective, and excellent medical care. Cancer of the breast is one of the most common forms of the disease in American women, the American Cancer Society says, noting that there is a 1 in 8 chance a woman in this country will develop breast cancer. Doctors this year will diagnose more than a quarter of a million new cases of invasive breast cancer in women, and more than 40,000 women will die from the disease. Modern medicine’s making progress in changing and saving the lives of women and men with breast cancer. But the progress doesn’t mean that the therapies can’t be difficult and costly. Specialists themselves have expressed growing concern about this toll and how it affects outcomes for patients and their loved ones, developing a term — “financial toxicity” — to describe these negatives. It’s also true that cancer over-testing has become a flash point in national discussions about medical costs, and doctors in different areas of care (heart experts) have started to criticize cancer specialists over the harsh effects of their aggressive treatment. Big Pharma, of course, has put patients, employers, insurers, and medical providers in a bad spot with its profiteering, especially on drugs used in cancer care. It’s good to see that Uncle Sam — the National Cancer Institute, part of the National Institutes of Health —helped to underwrite some cost-cutting research on lessened chemo. But the Trump Administration, while persisting in the president’s claim that he will attack and reduce drug costs, has just seen a drug maker jam through list price increases of $1,000-a-month for two cancer drugs. Federal watchdogs also have just sounded alarms for Uncle Sam about fiscal problems that soaring and questionable prescription drug costs may pose, especially in the giant Medicare program. We’ve got a lot of work to do to improve the cost and effectiveness of cancer care, especially when it’s driven by expensive medications.